I wish I could make money with my art, I am gifted/talented the same as you. I only get people in my life that are looking not to compensate me for my skills...people are cheap or diminish the talent as if it there is a fine artist available anywhere. What do you say to those that discredit our gift/talent and expect our work to be cheap...Or how do you find clients that respect our gift/talent? I regret to say that I never responded. But it's a legitimate and sincere question I see many artists struggling with: how can I make a decent living when everyone wants work for cheap? When it comes to art careers, there are two parallel universes that exist. A screenshot I took recently of a conversation on Facebook. 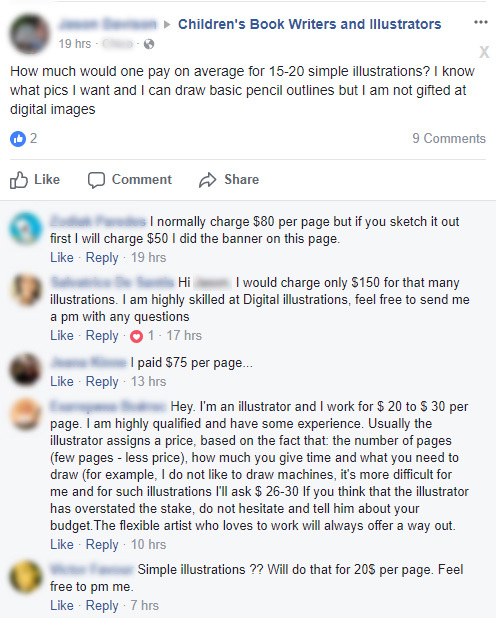 "I just want a few quick sketches, shouldn't take you long, so I think $20 is fair"
Unfortunately, this is the first universe that beginning artists usually encounter. They look around and ask themselves, "Is this what it means to be an artist? Is this really how much society values my skills? How can I possibly make a living doing this?" This is the world of publishers, design agencies, video game companies, animation studios, ad agencies, art collectors, and even the occasional well-off author or other individual. These are clients who understand the value of a good artist and respect them enough to pay them well. 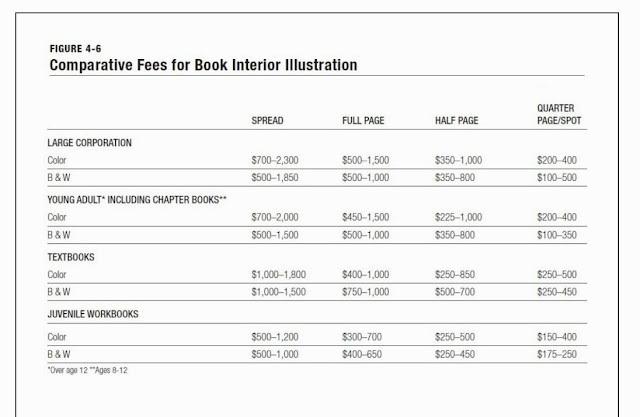 In this world, it's normal to be paid hundreds or thousands of dollars for a single illustration, even tens of thousands for some projects. I don't want to give the impression that illustration is a gold mine. It's extremely competitive and honestly often not particularly lucrative. I'm also not saying that everything at the professional level is perfect and artists are always treated well buuuuuut that's another blog post for another day. There's nothing wrong with starting small, but there's more out there than random people asking you to draw stuff for pennies. There are better things out there. So how does one break into the professional world? Two steps, both of which are easier said than done. Well, it's sort of three steps. The door to the professional universe doesn't lie in posting "please hire me" on forums, Facebook, Craigslist and the community bulletin board at your local cafe. It doesn't lie in telling your neighbors and friends that you're an artist. No matter how much hustle you have, this is only going to bring you exactly the kind of amateur clients you're trying to avoid. Who are the famous, well-known artists in this market? Can you follow those people on social media? What events do they attend, what competitions are they entering, what new projects are they launching? Who are the major, minor and mid-level publishers/companies/agencies/magazines? Do they have submission guidelines on their websites? What books/comics/video games/products have they released lately? Are there any conventions where you can meet both professional and aspiring artists? Are there agents who represent artists in this industry? In step one, you identified the gatekeepers of the professional world. But if you have nothing good to show them, they're not going to respond to you. They're not going to open that door. Immerse yourself in published art from the market you're interested in. Get out of the house and visit bookstores, comic book shops, galleries or wherever it is that you'll find the kinds of products you're interested in creating. You want to consume lots and lots of professional-level artwork so that you can raise your taste level and start to distinguish professional art from amateur. Attend a convention and get a portfolio review from a professional who works in the industry you're interested in. Write an email to an artist who works in the industry you're interested in. If you're polite, most artists are pretty nice and generous with their advice. Submit your artwork to professional contests such as Spectrum, SILA, Applied Arts or Communication Arts. Look at past winners of those contests and compare their artwork to yours. Submit your artwork to art reps (agents) and see if they respond. If you come to the conclusion that your art isn't good enough right now, you don't have to give up. But you do have to decide whether you can put in the time and effort that it takes to get your art to that level. 3. Keep doing steps 1 and 2. Make good art. Show it around. Then, keep making good art. Keep showing it around. When you meet with rejection, and you will, don't let it get you down. Keep making good art and keep showing it around. Eventually you will get your foot in the door of the professional-level universe. Let's say that you're following the steps above; you believe that your work is at or near a professional level, and you're pursuing professional-level clients. And yet over and over again, emails pop into your inbox asking you to work for chump change. What are you doing wrong? Answer: Nothing. You're doing nothing wrong. It happens to all of us. Quick story: I had a table at an artist alley at a convention. A guy stopped by my table and we chatted some. A few weeks later, he emailed me asking to illustrate his 50-issue comic book series for free. I gently explained to him that art was how I made my living and that what he was asking for would take me years to do. So unless he was willing to pay me an entire year's salary, I couldn't afford to take the job. You will always hear from the amateur universe, people who recognize good art but underestimate how much good art costs. Don't worry about it. Don't take it personally or as a judgement on the value of your work. Don't bend over backwards trying to convince a broke person to pay you more. I wouldn't even spend the emotional energy in getting offended by it. If you plan on freelancing, turning down cheap work is going to be a regular part of your job. Think of it as "cheapskate whack-a-mole" if that helps. Develop a template polite response. Maybe take a moment to educate the person a bit. Write "I don't work for free" on the contact page on your website. Then get back to making good work and showing it around. Thank you Kelley, this is so helpful! I'm really struggling to get out of the "amateur universe" and I feel lost. Your article is an excellent guide for me and illustrators that are in my same situation. I think I couldn't see very well the entire scenario. This is WONDERFUL, Kelley! I've been flitting around the industry--half in, half out--but I'm trying to go more 'in'. (I have kids to put through college, heh.) Would you happen to have any information on the fees for cover art? I don't want to undercut the market, for many of the reasons you noted above, but nor do I want to overestimate my "worth" (as someone with some skills to hone). Thanks bunches! I'm in the US, so this is super-helpful! (I'm a small step above "beginning", but it confirms that my pricing is in the ballpark.) Thanks again!